Dodge jumped into NHRA stock and super stock in 2009 after Ford came out with the Cobra Jet in 2008. 100 Drag Paks were sold in 2009 with # 01 going to Don Garlits. The 2009 cars could be ordered with the 5.9 wedge, 5.7 or 6.1 Hemi. The cars could be set up for an automatic or stick although the transmissions were not included with the car. The cars were sent from the factory as a body in white to Roush Racing in Livonia, MI. 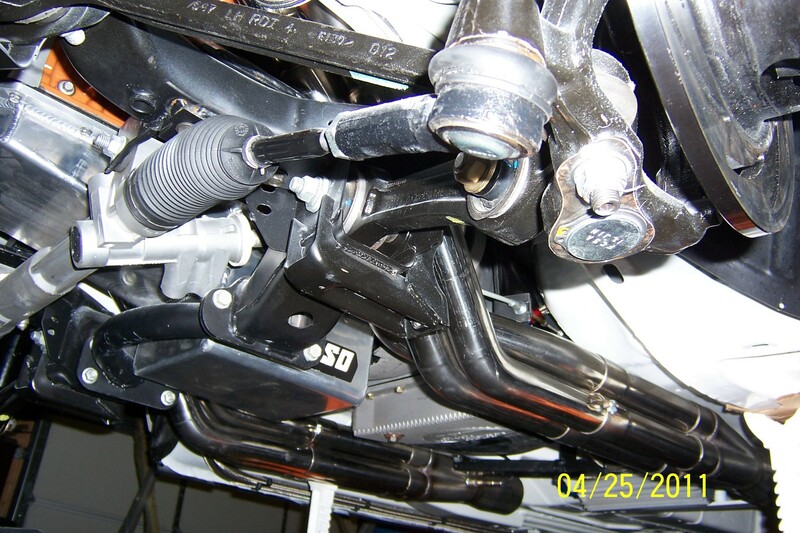 Roush employees installed the new relocated motor mounts and crossmember. They also installed lightweight side windows, Strange hubs and front brakes. The cars were then fitted with a carbon fiber hood and tray to seal the throttle body to the scoop. Racing seats and a new switch panel completed their work. 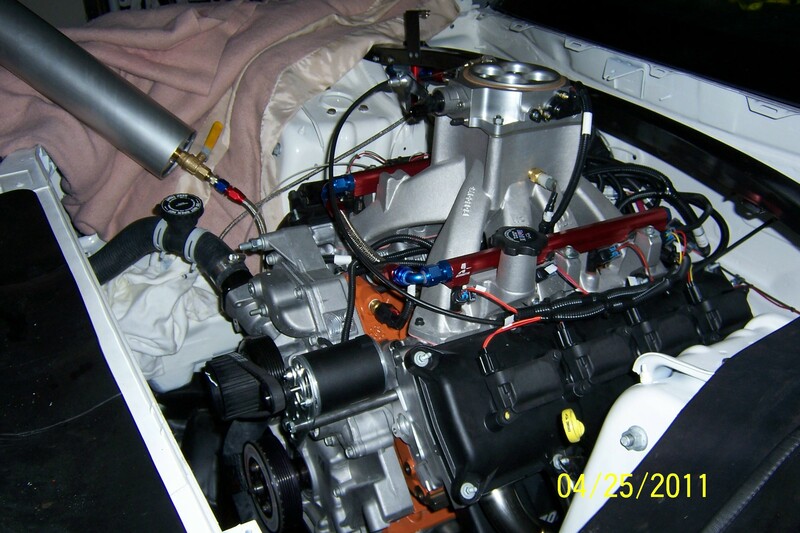 Engines were supplied by Gary Stanton and installed at Roush. These cars came with a boat trailer axle for shipping. 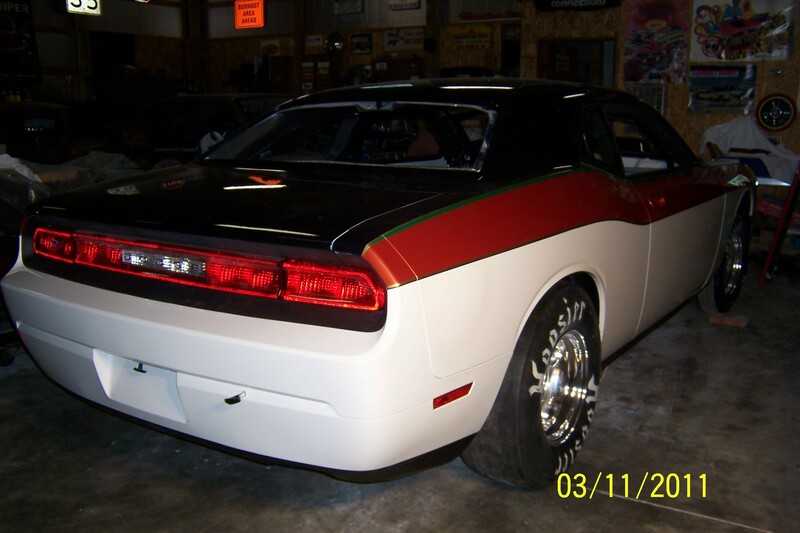 The 2010 Drag Paks were limited to 6.1 or 5.7 Hemi’s. The 6.4 was also accepted by NHRA and could be installed by the owner. Dodge only made 50 Drag Paks in 2010. Dennis was able to order # 0018 thru Washington Chrysler Center. His car came with the 6.1 and was set up for an automatic. He had Matt Wright at B.R.C. Racecraft install the rollcage, chassis and rearend. Cope racing built the 727 automatic and Jones Engineering balanced the rotating assembly, checked the block and crank as well as back cut the valves. Stock rules limit modifications to the engine but certain upgrades will make the engine rev to 8500 rpm. His car is classified as A/SA but can run AA/SA or B/SA with a weight change. The car was painted by David Donaldson at the Auto Clinic. David painted the top Deep Amethyst, the belt line Copperhead Orange, and a ¼” stripe of Electric Green. The 3 colors are separated by a gold 1/8” stripe leaving the bottom half of the car white. 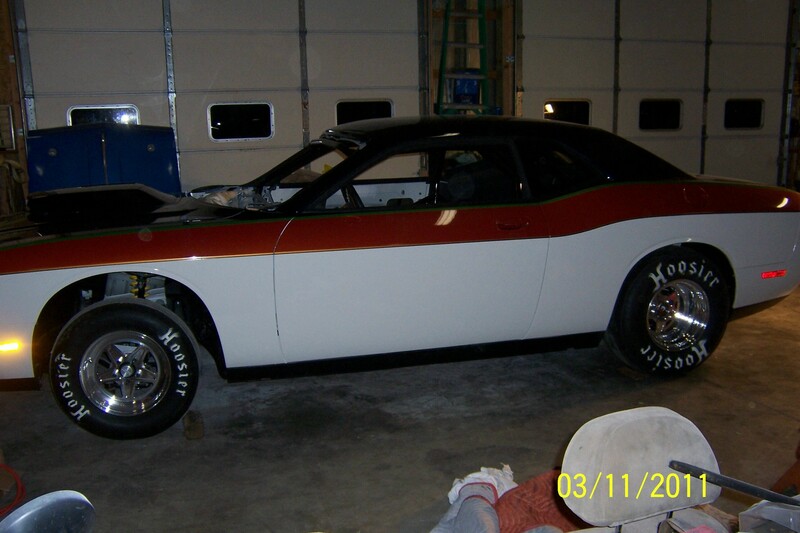 Dennis painted the engine compartment, trunk and underside of the car at his garage. He assembled the engine, installed fuel and brake lines and painted the rollcage. Wiring was next, followed by installing the fuel injection system. Jackie helped with installing the interior and finishing touches. The year 2012 started with a trip in February to Southland Speed in Houma, LA. I took the Drag Pak to Southland where we made 10 pulls on the engine dyno and then reinstalled the motor for track testing. We were able to find 18 more hp by changing the tune on the FAST computer. We took the car to Belle Rose, LA and ran 3 passes. Our best pass was 9.74 at 137.85 mph, which was 3/10 of a second quicker than any previous pass. The weather was near perfect which helped, and the car was flying. Two weeks later we went to Gainesville, FL for the Gator Nationals. The car would only run 10.08 but it was quick enough for my first ever top 16 qualifying spot. I lost in the first round by .002 of a second on a double breakout. I broke out by .004 and my opponent broke out by .002. Close but not close enough. We traveled across I-10 back to Belle Rose for the Jeg’s Cajun Sports Nationals the following week. After a 9 inch rain on Sunday night, the pits were flooded and we could not pit until Tuesday. Because our 6.1 combination had been hit with horsepower at the Gators, I was now running in CC/SA instead of A/SA. My index dropped from 11.00 to 10.60, which is a lot to make up. In class elimination I was runner up to a 69 Camaro with a 427. On Sunday during stock eliminations I went out first round again, this time by .006. Tough two weeks but lots of good times! My next race was our first Division 3 race at Indy in April. It was cold and rainy all weekend, but well worth it as I won my first Wally! There were 102 stockers, so that meant 7 rounds of racing on Sunday. I won the final by .004 of a second over Andrew Hill in his 72 Camaro. Two weeks later I headed to Norwalk, OH for another division race. I won first round with a good reaction time and lost second round with a terrible reaction time. Joliet, IL was next in June, another division race. This time the car slowed by a tenth and a half the first round, and my logs showed I was losing oil pressure. I took the car home pulled the motor apart and found a spun rod bearing. Luckily no damage was done to the crank, so the rod was resized and the motor went back together. For 2011 Dodge produced a 512 cubic inch V-10 powered Drag Pak. Dodge made 75 available and they came complete ready to race from the factory (Roush). Next year the 2012 Drag Paks will have a 6.4 supercharged Hemi as Ford and Dodge keep upping the ante each year. The blown Ford super stocks have run low 8 second times already and the V-10 Drag Pak set a new AA/SA record at 9.43 @ 144 mph in stock. The 6.1 A/SA cars have run as quick as 9.71 @ 138 mph. Chevrolet is yet to join the other two manufacturers but the rumor mill says 2012 will be the year for a Camaro factory drag car. Looks a lot like the 1960’s again! 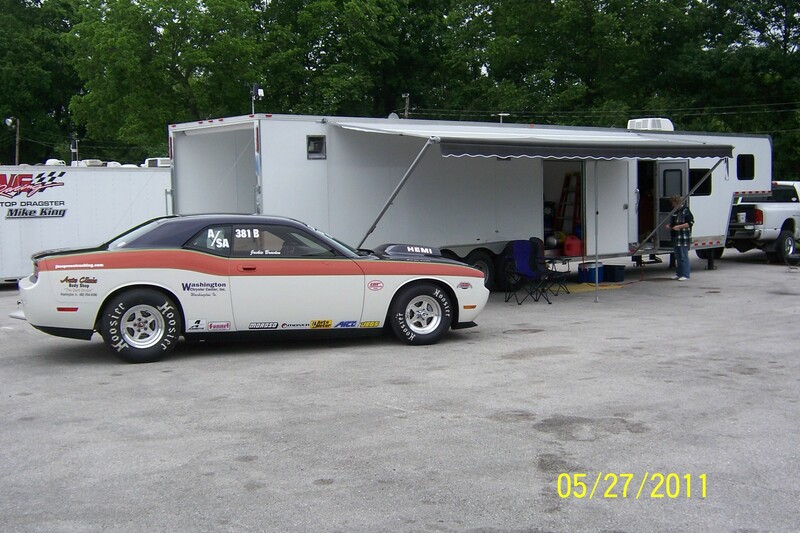 At the Sportsnationals at Bowling Green on Memorial Day Weekend, there was a stock super stock combo race on Saturday resulting in a throttle cable breakage in the second round. On Sunday, the car ran off and went out in the first round. Dennis says he thinks there are still a few new car bugs to work out! More updates to come later. Columbus, OH was next and more engine trouble. On my last qualifying pass, the intake valves hit the pistons and I was done for the weekend. Sam Jones was already working on a 5.7 block so I could run in A/SA again, so we skipped the race in Stanton, MI to finish up with our 5.7. We finished putting everything back in the car one day before we had to leave for Brainerd, MN. This was a national event, and they were running class, so I wanted to make the race. Unfortunately I had nothing but problems. The car was running extremely rich, and would only run a best of 10.21. Not enough to qualify in the top half or win class. I went out first round after I hit the brakes too hard and gave up the finish line. I headed back to Indiana, and then on to Bowling Green, KY for our last division race. Still major problems with the fuel injection, so not a good race again. I changed injectors and sensors and headed to Indy for the US Nationals. After working two nights in a row, I qualified on my last try by .002 of a second. Only the top 128 cars qualify to race at the Nationals and I was #128! First round I had a better reaction time, but the car slowed by a tenth again. across the country. Like every other racer I want to be #1, but I still enjoy the sport no matter where I finish. Next year may see me running Super Stock with the Drag Pak, it fits right into SS/JA, and I still get to run on the 11.00 index. The car will be rewired this winter and will have a transbrake put in it along with a few other changes. Super Stock rules allow porting your heads, any cam, bigger tires, etc. 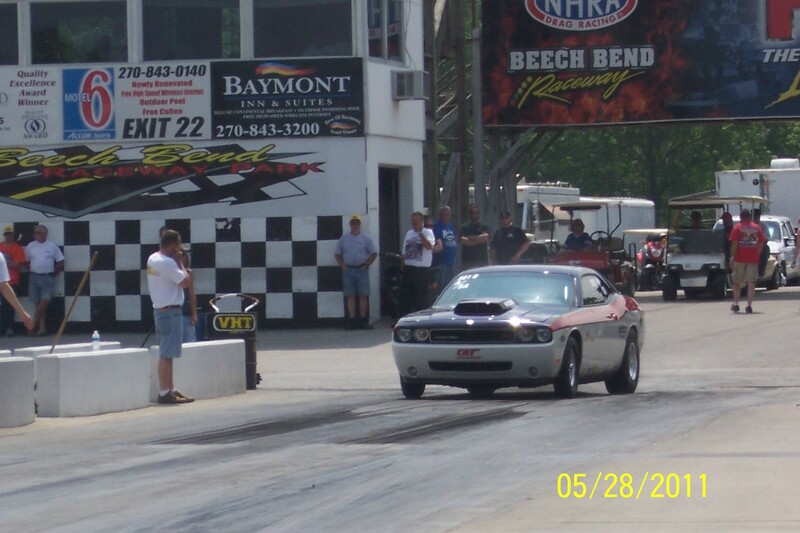 In legal Stock trim I can run 8 or 9 tenths under the index for Super Stock, so qualifying should be no problem. And if that’s not enough, the heads and intake will go to Jones Engineering for a little work, and more horsepower!